Buy a set of adjustable-weight dumbbells, or try out various weights at a gym. If you're wondering what the best dumbbell weight is for women, the answer is the weight that works for you. You get tired after a mile or two of running, while your bestie can crank out five or six without any trouble at all, so why would you think lifting weights is any different? When you're looking to start a dumbbell routine, you may need to play around a bit to get to the right weight, keeping in mind that the best weight for you is going to change all the time. There's a very good reason there's no specific "best" dumbbell weight for women: at the end of your weightlifting set, your muscles should feel really tired, as if you almost can't complete the last few repetitions. MayoClinic.com recommends that most people do a single set of 12 to 15 repetitions "to fatigue." For you, that could mean using a 10-pound dumbbell; for your best friend, that could mean using a 5-pounder. Now you know how you're supposed to feel toward the end of your set -- but how do you know how much weight to pick up in the first place? If you're a total newbie, aim for a really low weight and see how that feels. Pick up a 1-pound or 3-pound dumbbell, some of the lightest weights on the dumbbell rack, and try them out. If you're somewhat fit already, try a 5- or 8-pounder to start. If the weight feels heavy when you pick it up, chances are it's going to be too heavy for you to lift safely. 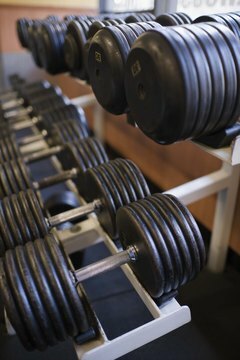 Lifting the dumbbells safely and correctly is more important than trying to crank out a set with a weight that's too heavy. Another thing to keep in mind -- you may be able to lift different amounts of weight for different exercises. For most people, the purpose of lifting weights is to gain strength and build muscle -- not to mention the benefit of maintaining the bone density that all women start to lose as they age. According to the physical activity guidelines set forth by the U.S. Department of Health and Human Services, all adults should lift weights two days a week, working each major muscle group. After you've lifted that 1-pound or 3-pound starter dumbbell for about two weeks, your muscles will start to become adapted to that challenge. That's when it's time to move to a weight that is 5- to 10-percent heavier. Keep adding about 5 to 10 percent every one to two weeks as you continue to get stronger. If you're recovering from an injury or you have a chronic ailment such as arthritis, it's important to get your doctor's OK to start a weightlifting routine. She may have specific recommendations for types of exercises to do. She may also refer you to a physical therapist or other health professional to start a therapeutic lifting routine. If you've been mostly sedentary before this, you may also consider going through the motions of the exercise without any weight at all for a week or two and then moving up to a 1-pound weight. Also consider hiring a personal trainer to guide you through correct movement and help you assess your fitness level. 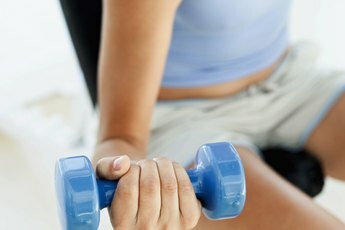 What Size Weight Should Women Begin Lifting Weights With? What Is a Good Weight for Shoulder Presses for Women? At What Weight Should a Woman Start Leg Presses?